This post has been a long time in getting ready. I have recently become totally involved in a few new sites. After searching for ages for art blogs and finding nothing I have hit the jack pot! There is just so much really good stuff out there. Try Sixty Minute Artist, or Art and Perception, or A Painting Journey / the Painters Keys or Art News !!! I have been totally hooked in and am learning just so much! 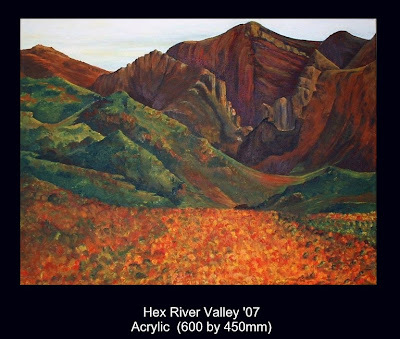 I painted this Hex River Valley scene and absolutely hate it. One of these days I will paint over it, but in the meantime I painted two little miniatures of the original using just three colours. The first one was Burnt Sienna, Ultramarine and white. The other was Cadmium red, Phthalo blue and white. I am really sick of this view now but have learned so much by doing this exercise. It's amazing how going back to the first painting it now looks all wrong. I just didn't see it as I should have. I suppose that this is part of learning process. A lot of patience is needed. One learns from mistakes and grows all the time. Thanks to all those experienced artists out there giving tremendously helpful advice. Hi Carol, nice to stumble across you while blog hopping (this internet is amazing, I started in Portland, Oregon, got to Australia, Germany, France, 60minute artist and lo and behold, I spotted your comment about 'good old SA'! I live down the coast from you, in PE, and am also in my 50s, gave up my interior design business earlier this year to paint full time, and haven't looked back. LOVE IT!! This is an interesting exercise, I need to get more disciplined about tonal studies and sketching, I tend to get all excited and jump in to each new painting with loads of enthusiasm and very little planning! I have never used Cad Red and Pthalo Blue to make grey, I usually use Ultr and Burnt S but it is much warmer, thanks for the tip! Thanks for the visit! My daughter is an also an interior designer! Works for architects. Yes, this painting business is full of ups and downs - but I love it!